In this article we will explain MPPT vs PWM Charge Controllers Comparison. At first glance, a charge controller may not seem so important. Charging batteries is a big part of an off-grid system, but can’t you just wire your renewable energy source straight into your batteries and be done with it? The answer is yes, but that you definitely shouldn’t. Batteries are the most expensive component of your off-grid system and charge controllers actually protect them while charging. As a lead-acid battery (the current standard for solar and wind applications) charges, the optimal voltage for charging the battery changes (for more details, please click to read our Battery Basics article). A charge controller insures your battery is always charging at or close to this voltage, which extends battery life. Even if you have high voltage solar panels and a low voltage battery bank, the right charge controller will still bring your battery charging voltage to a safe level! Now that we’ve established that a charge controller is absolutely essential, let’s go into the two types of charge controllers and their advantages or disadvantages. There are currently two dominant charge controller technologies on the market: MPPT and PWM. While they both match your power source’s voltage to your battery voltage, they do so in different ways, which makes them suited for different types of applications. Regardless of the renewable energy source for your power, the benefits and disadvantages of each technology do not change (though the specific controllers you can use may). The alternate power source and storage batteries are the two principle cost items of an alternate energy system. The battery charge controller based on MPPT or PWM can do one of two things. The charge controller circuit of a MPPT controller (Maximum Power Point Tracking) unit is designed convert the voltage from your solar or wind power sources to the voltage optimum for maximum transfer of power to the battery or grid via a grid tie system. A PWM charge controller does not operate to optimize power transfer to the batteries; it is optimized to extend the life of the batteries. By applying higher voltage in short bursts a PWM controllers essentially clean off the lead plates that are a central part of the battery storage system. How to charge controller selection depends on if it makes sense to optimize power transfer, with an MPPT controller, or to optimize battery life, with the PWM charge controllers. To make this tradeoff, we need to understand the relative cost difference between solar panels and batteries. Solar panels have long life- most manufacturers offer guarantees for output good for 20 years or more. Battery life, however, is rated by number of deep cycles and the number is typically rated in hundreds of deep cycles. Since a standalone solar or wind system might cycle once a day, life extension of batteries can be an important goal. To understand the balanced lifecycle cost of the generation + storage system we need to understand batteries will be replaced many times before the solar panels or wind turbine needs to be replaced. If we look at a very rough cut with solar panel life equal to 20 years and battery life equal to 1 year, we can estimate one dollar of battery is equal to twenty dollars of solar panel. How to select a charge controller is how we make this tradeoff. First, consider solar battery charge controller systems that could be categorized as battery powered with solar charging. A good example might be a sailboat used for weekend trips or a country cabin. Such a boat might spend a week on a mooring or at the dock, and then used on a trip of a night or two, with deep discharge of the battery expected with every use. A cabin may sit in the sun for a week, and then deliver power to the limits of the battery capacity for when visited. For both of these, there is plenty of time to charge the battery, and in fact the boat might be able to use marina supplied grid power to do the charging. For both of these, deep discharge of the battery and consequential wear and tear on the battery is to be expected. In a system like this, the critical variable is battery life, suggesting the use of a PWM charge controller. Efficiency of conversion of solar power to battery power is not the key variable since there is plenty of time to charge the battery, or charging from grid is possible and included in marine ship rental. Because they are less complex, PWM controllers are less expensive than MPPT systems. They are a great choice for systems where your battery and panel voltages are matched. A few years ago, Schneider Electric bought out Xantrex’s line of charge controllers. These controllers remain an excellent choice for your off-grid system. Low cost Morningstar PWM charge controllers offer a wide selection of PWM devices to match any battery voltage and power range. 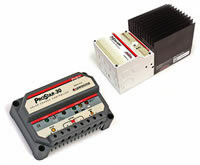 The 12 volt charge controllers are very common for PWM systems on mobile homes, boats and cabins. The Duo even allows you to charge two separate battery banks! Not all systems face the same challenges as a sailboat or country cabin. The typical home solar power system has access to the grid for backup power and can even sell excess power back to the grid using a grid-tied inverter system. If there are batteries, they are used only for short term, emergency backup when both solar and grid power are unavailable. For this type of system, maximum power transfer from the solar panel or wind turbine to the battery or grid is important. This is where MPPT technology comes in play. MPPT solar controllers are considerably more elaborate than PWM controllers. The optimum voltage for battery charging changes as the battery’s state of charge changes, and the panel’s output varies depending on temperature, available sunlight, and more. The MPPT charge controller matches these two voltages and can result in up to 30% more efficient charging. This means a good MPPT solar charge controller can delivery the same level of charge with fewer panels, a tremendous benefit. While only a small part of system price, a MPPT solar panel charge controller can leverage the rest of the system to better performance. Blue Sky was the first to develop MPPT controllers; they’ve even patented their technology! Their Solar Boost MPPT controllers include the most options for voltage and power. Outback offers a pair of excellent MPPT charge controllers as well. While these aren’t as varied as the options offered by Blue Sky, they do an excellent job of fulfilling the market’s need for larger controllers. The search for alternative energy sources in the age of climate change has overlooked tidal energy: a vast and unexploited worldwide resource. For three decades now, tidal lagoon schemes have been recommended as an economically and environmentally attractive alternative to tidal barrages. More recently, two proposals for tidal lagoons in Swansea Bay, Wales have emerged and there have been several reports documenting how such a project there could have the potential to harness significant energy resources. Tidal/wave energy involves constructing a barrage, a dam or some other sort of barrier to harvest power from the height difference between high and low tides. The power is generated by running the water through turbines, found within the barrier. The technology used is very similar to that found in hydropower schemes, however unlike rivers tidal currents run in two directions. Where a tidal barrage blocks off an entire estuary, a tidal lagoon instead impounds an artificially created area of the sea or estuary. A lagoon doesn’t necessarily have to be connected to the shore – it could even sit out in the ocean. As the tide goes out the lagoon remains closed, and full. It then opens the flood gates to let the water out until water levels on each side of the lagoon wall are even. When the tide comes in the process is reversed. It’s tough to estimate exactly how much tidal power can be exploited, but the UK may have close to half of Europe’s total. And few potential sites worldwide are as close to electricity users and the transmission grid as those in the UK. Swansea Bay is located in the Bristol Channel on the South Wales coastline. As part of the Severn Estuary it experiences one of the world’s largest tidal ranges, often reaching 10m. A tidal lagoon has been mooted in the bay before, back in 2004, but the latest proposals are on a grander scale. The structure shown below would cover 11.5 km2, cost £913m to construct, and would be capable of generating 495 GWh per year – enough energy to power 155,000 homes. The Swansea Bay scheme demonstrates a renewed interest in tidal power, which has many advantages compared to other renewable sources. It is well documented that increasing integration of volatile, unpredictable sources of renewable energy such as wind and solar power jeopardises the stability of the power grid. In order for the grid to remain stable the power generated at any instance has to match demand, therefore it is important that the transmission network contains power sources that are immediately available. 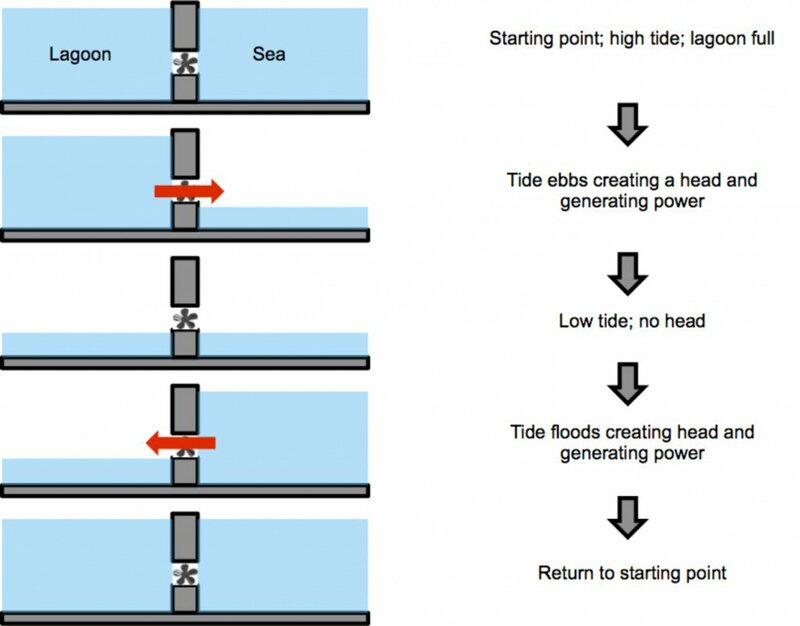 While the sun may stop shining, and the wind can drop, the tides remain predictable – an obvious advantage for tidal power and a great help for National Grid forecasters. Yet improvements are still needed. The upfront costs remain high, and there are some ecological implications. Experiences with artificially closed compounds have demonstrated that the costs of managing an artificial tidal basin (for example in the case of La Rance, Brittany, and Cardiff Bay), Wales are high and need careful monitoring and planning. Turbines can become more efficient, perhaps learning from the wind industry about aspects such as varying the speed of turbines. We need to develop better 3D modelling to get a better sense of how the tides ebb and flow, and how turbines perform under turbulence. But there are important positives that should lead to more tidal power. The re-opening of dams and barriers, often built between the 1950s and 1970s can have great ecological benefits for the water bodies behind them due to a creation of a gradient that is beneficial to aquatic ecology (brackish water) and an increased oxygen content; in such instances, tidal technology can also be used as a tool for water quantity management, while generating power. They can actually improve some ecosystems and have additional societal benefits besides renewable energy such as flood defense, environmental and ecological water quality improvement, fisheries and even tourism functions. New technologies are being developed that would allow energy to be harvested from new areas, where the difference between high and low tides are measured in centimetres rather than metres. All this make an investment in a tidal lagoon for Swansea Bay seem like a strong investment in the future. Author: George Aggidis is a Director of Lancaster University Renewable Energy Group & Fluid Machinery Group at Lancaster University. Solar Wind Energy Tower, Inc. is the innovator and creator behind the only hybrid solar-wind technology in the market today named Solar Wind Downdraft Tower. 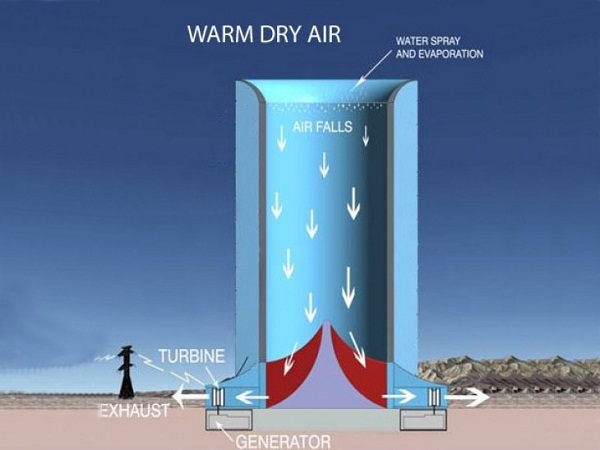 The simplicity of Solar Wind Energy’s revolutionary solution lies in its ability to harness the natural power of a downdraft created when water is introduced to hot dry air within the confines of the company’s patented tower structure. Solar Wind Energy’s Tower is unique in that it does not have any operational limitations in terms of time. It’s capable of operating around the clock, 24 hours per day, seven days per week in contrast to the operational limitations with solar collectors that work only when the sun shines and with wind turbines that work only when the wind blows. Boasting a small footprint compared to other wind or solar solutions and with a much lower capital cost per Megawatt, Solar Wind downdraft tower technology can truly impact the production of and investment in clean energy. Recently an independent renowned economist completed an “Economic Impacts” report of the Company’s Arizona Tower project. The report concludes that the impact of the project using IMPLAN guidelines is 19,588 jobs, $1 billion of labor income, $1.673 billion in value added contributions to the Gross Regional Product, and $2.8 billion in industry output or revenues within the study region. Following this report, a formal Business Plan was completed supporting $200 million EB-5 of financing. Iceland’s position atop the separating European and American tectonic plates has created a unique and savage landscape. The combination of fire and ice created global travel chaos in 2010 when the eruption of Eyjafjallajokull led to thousands of cancelled flights across the world. As the world watches the quivering Bardarbunga volcano amongst fears of a similar event, it is worth remembering that Iceland’s volcanism brings clean energy benefits as well as risks. Due to the high volume of electricity consumption by the aluminium industry, and the country’s population of just 320,000, Iceland has the world’s highest electricity consumption per capita, using more than four times the electricity per capita per year than an average inhabitant of the United States, and more than forty times that of the average Mexican. However, the Icelandic energy mix is the envy of many countries – electricity is produced entirely from renewable energy sources: hydroelectric (70%) and geothermal (30%), and when one considers total energy (including hot water used for heating) around 68% of energy production is from geothermal resources. More than 90% of all houses in Iceland and 100% of the houses in Reykjavik are supplied with geothermal water, which is used for both heating and as use as domestic hot water. To distribute this water, within the city of Reykjavik alone there are over 2700 kilometres of piping, enough to stretch from Reykjavik to Milan. Hellisheiði power plant, operated by Reykjavik Energy, is the largest and newest of 7 geothermal power plants in Iceland. The plant was constructed in 2006, and produces 433MW of energy, comprising 303 MW of electricity (enough to provide for 2/3 of the city of Reykjavik) and 133MW of heated water which is used for domestic heating. The plant is built on the shoulder of Hengill, an active volcano, situated around 30 minutes’ drive from downtown Reykjavik. The volcano last erupted approximately 2000 years ago, and the combination of high ground temperatures and ground water results in the resource that is currently being exploited. At the power plant, wells have been drilled down 2000 meters, and hot water is extracted at 340 degrees Celsius, and between 30 to 70 bar. The steam and water are then separated. The steam is used to turn turbines, which generated electricity similar to any other conventional power station, steam is the re-injected into the subsurface. As the water is rich in dissolved minerals it cannot be used directly in to heat houses, as the minerals would precipitate out as it cooled and clog pipes. A heat exchanger is therefore used to heat cold water extracted from a subterranean river just 60 metres below ground. It is this water that is supplied to the city, and the geothermal water is disposed of by being pumped back below ground where it came from. The fresh hot water is piped 25 kilometres from the power plant to Reykjavik by gravity. The water enters the system at 83 degrees Celsius, and in the two and half hours it takes to reach large storage tanks in the city it loses just two degrees. It is ultimately delivered to residents at 76 degrees Celsius. The water leaves buildings at 30 degrees and must be cooled further before it can be released into the ocean. It is therefore used to heat parking lots, golf courses, football pitches and other public areas before finally entering the North Atlantic Ocean. So, is the energy produced at Hellisheiði low carbon? Absolutely. 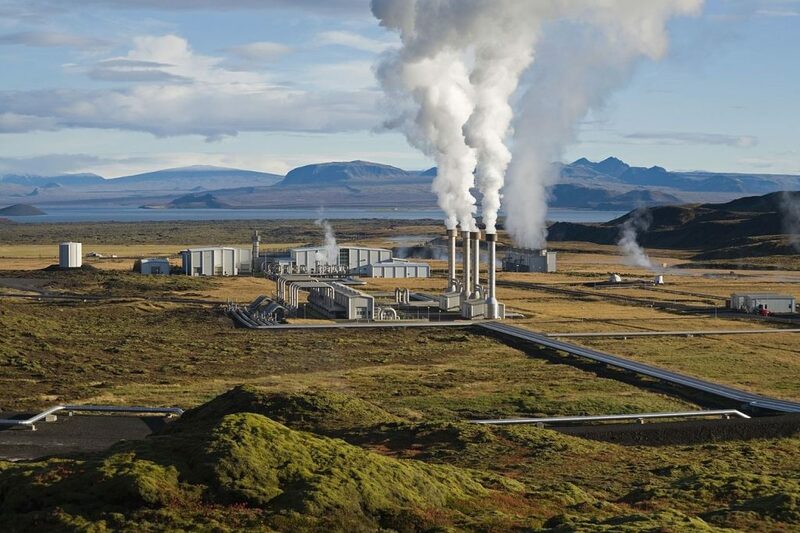 Not entirely, carbon dioxide is contained in the geothermal water that is extracted from the subsurface to operate the plant and geothermal gas emitted from Hellisheiði is 58% CO2. Annual emissions of CO2 from the plant in 2012 were around 43 200 tonnes, or 16kg/MWh. To put this in context in the United States average greenhouse gas emissions from coal-fired generation are just over 1000 Kg/MWh of carbon dioxide. However, the plant’s operators are working to improve the carbon footprint of the process though CarbFix an innovative new research project that is looking at turning CO2 back into rock. Iceland is blessed with a wealth of green energy opportunities, but with only 320 000 inhabitants, there are limited opportunities to use it. Because of this the Icelandic Government has worked hard to attract electricity intensive industries such as Aluminium and Ferro-Silicon producers. The cable would need to be between 700 and 1200 kilometres long and could supply up to 1200MW of clean Icelandic energy to consumers in the UK. This is longer than the world’s longest current undersea cable, the 580 kilometre NorNed cable that links Norway and the Netherlands. NorNed, a 600 million Euro high voltage (±450 kV) DC cable began operating in 2008, and has a capacity of 700MW. Longer cables are planned in the Mediterranean, most notably the Euro-Asia connector. This project aims to link the power grids of Greece, Cyprus, and Israel and would result in a cable between 1,000 and 1,500 km long, with an expected capacity of 2,000 MW. Icelink (as the UK/Iceland cable is known) would be shorter and shallower (depth is a big issue for undersea cables) than the Euro-Asia connector. The project has also attracted the attention of National Grid who discussed the idea at a conference in London in late 2013 attended by Mr. Ólafur Ragnar Grímsson, the President of Iceland who has expressed a consistent view that Iceland and the UK should work together to explore the feasibility of the project. According to Askja Energy, an independent Icelandic Energy portal, the cost of electric power from a subsea connector from Iceland to the UK could be around around GBP 100/Mwh, potentially providing power at substantially lower prices than offshore wind. Clearly the will of the Icelandic people will be critical to whether the project is ultimately realised, as concerns have been expressed that the cable will ultimately raise domestic energy prices. In May 2012, UK and Icelandic ministers signed a memorandum of understanding over the proposed new interconnector between the countries and discussions on the cable are continuing. It remains to be seen whether this exciting prospect will ever be manifest. Serial entrepreneur and Tesla Motors CEO Elon Musk is no stranger to making waves in the technology sector. Earlier this year he decided to allow anyone to, “in good faith,” make use of the automaker’s patent portfolio without fear of being named in a patent lawsuit. The goal, he wrote in a blog entry on Tesla’s website, was to entice other automakers to enter the electric vehicle (“EV”) market by allowing them to leverage Tesla’s technology as a platform on which to build new EVs. Tesla announced it is cooperating with Japanese industrial giant Panasonic to development a new, US-based battery production facility. Dubbed the Gigafactory, the facility will be able to produce batteries for as many as 500,000 EVs per year by the year 2020. The scale of the production is projected to be so large, in fact, that by 2020 the Gigafactory alone would produce as much battery capacity as the entire world produced in 2013. Panasonic has long been a partner of Tesla Motors, having supplied the automaker with the lithium-ion batteries that Tesla used in both its inaugural vehicle, the Roadster, as well as the current Model S sedan and the upcoming Model X crossover SUV. By eschewing the creation of their own proprietary battery technology and making use of existing infrastructure, Tesla was able to cut significant costs from the most expensive part of any high-performance electric vehicle: the battery.The planned Gigafactory is a key strategic step in carrying out Tesla’s long-term mission to deliver lower-cost EVs to consumers around the world. In keeping with Musk’s environmentally sustainable reputation, the facility, which will sit on 500 to 1,000 acres, will not only recycle older battery packs but will also be powered by “new local renewables,” namely wind turbines and photovoltaic panels. Musk is also the Chairman of Solar City, which iscurrently ranked second among the top 250 solar contractors of 2013. This relationship would presumably add to the cost savings on the acquisition, installation, and maintenance of the solar piece of the renewable energy system meant to service the Gigafactory. Demand for the batteries will go beyond Tesla’s own customers. Jonathan Ward, founder of LA-basedIcon, a specialty auto manufacturer and modification shop, has indicated interest in using not only Tesla’s patents but also the very platform of the Model S to build a vehicle he’s calling the Helios. IFW Recycling Corporation sees a clear opportunity in the polluted skies by introducing reusable clean energy. According to CNN, inhabitants of Beijing are “choking as smog levels hit heavy or even worse levels.” Ironically, China is simultaneously one of the world’s biggest contributors to environmental pollution and largest producers of green & clean energy technology. Unfortunately for China, most of that technology is exported. As pollution problems continue to worsen, governments around the world are looking for any solution to solve their waste management problems. This is particularly true in countries like China that rely on coal fired plants to generate electricity. The problem of air pollution is becoming critical to the health of the population and driving investments to clean up the air, water and land. Wikipedia states that every year, over 260 million used tires end up in landfills across the world. In addition to the space they consume in the landfill, the tires contaminate groundwater and create toxic clouds of black grime when they ignite. Some jurisdictions purposely burn the tires in an effort to generate electricity. The problems associated with used tires have been accumulating for decades. According to Infohouse.com, over 75 percent of used tires end up in landfills every year. These tires are seen by most as an ever expanding problem, but to IFW Recycling Corporation these tires represent a clean, green and efficient source of fuel. IFW Recycling Corporation produces usable diesel fuel by gasifying the tires, while creating zero pollution and using 100 percent of the by-product (ash, carbon black and distilled water) all with staggering revenue, cash flow and profit results. Not only does the process remove the tires from being discarded as waste, the resulting products can be used by industry. Tires are difficult to dispose of because they don’t easily break down to become anything useful. Tires can be recycled for use on basketball courts and new shoe products. The material recovered from disposed tires, called “crumb,” is generally only used as a low-cost mixing material. It is rarely used in large volumes. 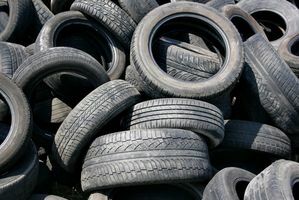 Up to now, any effort to recover the raw constituents used to create tires has been inefficient, as more fuel is needed to recycle the tire than is used to make a new one. There has been progress in converting the refuse and using old tires as raw ingredients for new construction materials. However, the best solution may be to burn the tires and extract the residue from them. The innovators at IFW Recycling Corporation have taken this technology to another level. The company has created a way to recycle tires called Direct Slow Pyrolysis, 2nd generation DSP2™. Pyrolysis is a thermochemical decomposition of organic material at elevated temperatures in the absence of oxygen. This process breaks down the tires into its usable base materials for clean energy. The DSP2™ process differs from other similar though inferior technologies by producing zero emissions while creating highly a marketable commodity. Furthermore, their re-engineered and fine-tuned DSP2™ process has addressed and eliminated the inefficiencies and inadequacies of other pyrolysis methods. IFW Recycling Corporation does more than just burn the tires for fuel for clean energy. The DSP2™ process breaks down the tires and creates usable diesel fuel as a byproduct of the recycling. This creates a cleaner source of fuel that can be used to power the recycling equipment or sold as a separate revenue generator. This fuel is in addition to the ash, carbon black and distilled water that are created from the slow controlled decomposition of the used tires. The resulting products add an additional stream of revenue and power generation in addition to cleaning up the toxic mess that accumulates in landfills. Because the new technology from IFW Recycling Corporation results in zero emissions the process is ideal for countries and cities that have air quality problems. In particular, a city such as Beijing would benefit from replacing coal fired electricity generation with green zero emission energy production. The rise of China as an economic power has resulted in smog and pollution levels that are threatening the health of the people living in industrial cities. In Shijiazhuang the largest city in China’s Hebei province, levels of tiny particles called reached 575 parts per million, and the measure of larger particles hit 843 parts per million. Health authorities say 25 parts per million is the safe level for humans. The disposal of tires, once a growing problem, could now be the source of clean, reusable power generation and profit. Companies like IFW Recycling Corporation are at the forefront of a whole new way of looking at green technology.